My slow cooker is like a best friend that always helps me out. Whether it’s a dinner party, a weekday meal or food for a crowd it’s reliable and creates delicious meals with little effort. 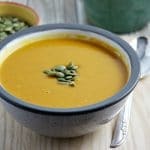 While I love a slow simmering soup on the stove this soup takes out all of the prep work and cooks the whole meal in one pot. While I have used olive oil to saute in the past I loved the change in flavour by cooking the onions in coconut oil. The delicious coconut flavour is sealed into the onions and spices and adds the perfect sweetness to the dish. 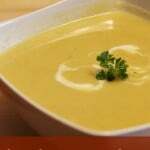 Plus with the addition of coconut milk this Slow Cooker Butternut Squash and Apple Soup is creamy, delicious and lactose free. You can find the coconut products featured in this recipe at your grocery store often located with the international food selection. Place coconut oil in a pan to melt. Add in onion and saute until onion becomes translucent. 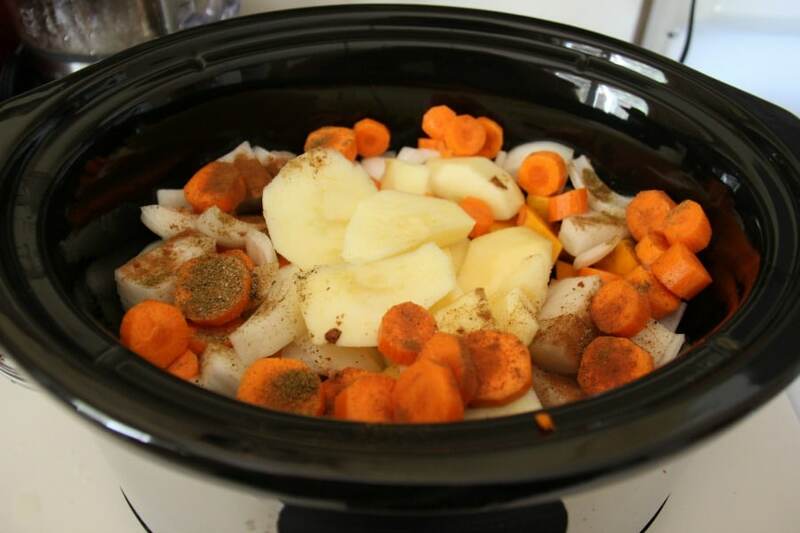 Place all ingredients in the slow cooker and cook on high for 4 hours or low for 6 hours. Blend in a Vitamix or use an immersion blender. Top with Grace Foods Coconut Chips. 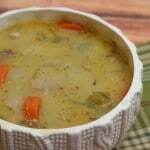 Serve with fresh baguette or alongside your favourite Fall/Winter meal. 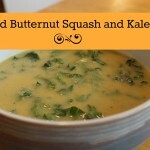 A delicious soup perfect for a Fall/Winter day. Filled with delicious ingredients and no pre-work required. If you haven’t cooked with coconut oil before than this is the perfect recipe to try it. With many health benefits and a great way to add flavour to your dishes coconut oil is the perfect swap for your regular cooking oil. 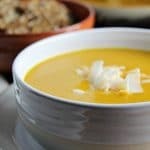 For more great recipes featuring coconut check out the amazing free ebook available for download Love Your Coconut. We are giving away an amazing prize pack from our friends at Grace Foods. 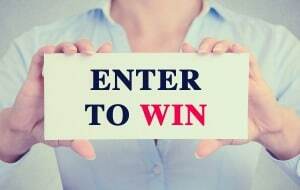 Prize will be an assortment of Grace Coconut Products that will equip the winner with easy swaps for healthier, delicious everyday cooking including Grace Organic Coconut Oil, Organic Coconut Sugar, Organic Coconut Milk, Coconut Chips and Pure Creamed Coconut. Approx. Retail value: $32. For full details see the Giveaway Tools. I’m most excited to try the Coconut Chips because they sound delicious. I would like to try the Coconut Chips & the Organic Coconut Sugar! I am most excited to try the coconut chips. 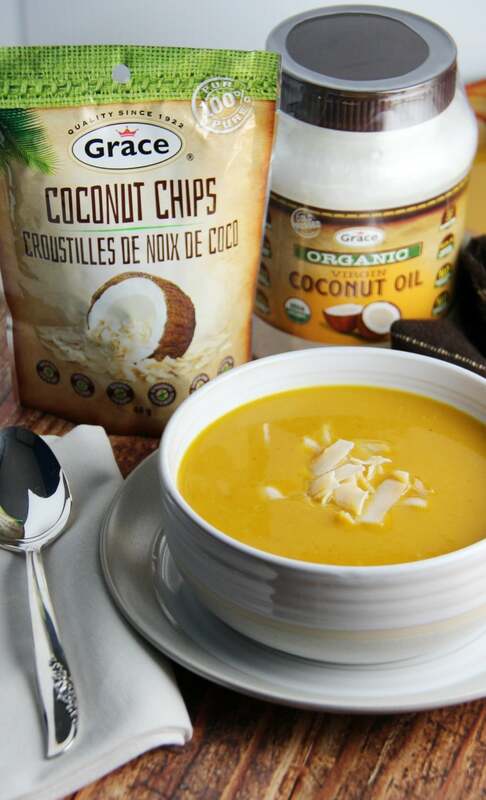 I would like to try the Coconut chips because I am trying more coconut products besides the oil. I would like to try the coconut chips. They sound delicious! I want to try their jerk sauce because I’ve heard great things about it! I would love to try the coconut chips. I love coconut and I think these would be delicious. 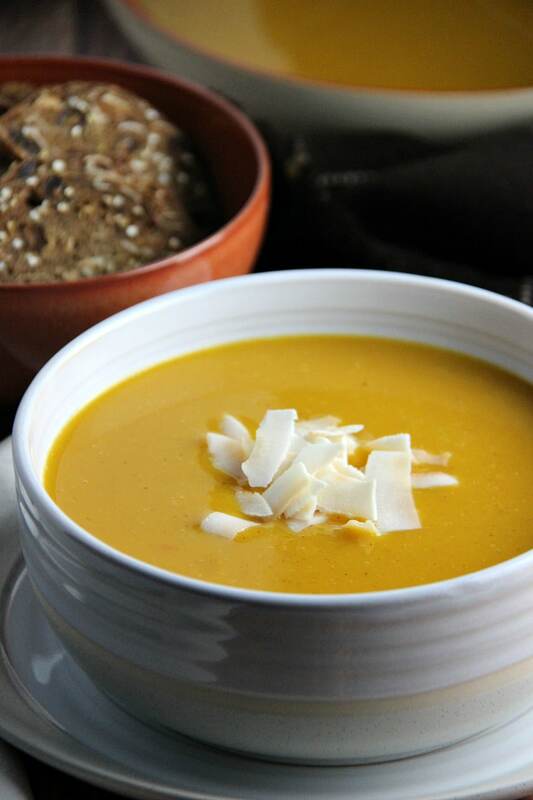 I have some coconut milk at home and I think that topping the soup with the coconut chips, which I have never tried would be awesome. I want to try the Coconut oil. I’ve never cooked with that before I’m curious on how it will taste. I’d love to try the Organic Coconut Sugar – I’ve come across a lot of recipes lately that call for it! I would love to try the coconut sugar and the creamed coconut, I haven’t tried those products yet and would love too!! I’m most excited to try the Coconut Chips! Sounds perfect for my sweet tooth! All of them! Pure Creamed Coconut especially since I have a recipe that I want to try that calls for it. Organic Coconut Sugar – I don’t think I’ve ever tried coconut sugar so would like to see what the difference is. I’ve never tried coconut chips and I love coconut so would love to try! The Coconut Chips sound delicious. I would love to try the organic coconut sugar. I think it would be a less processed alternative to regular sugar. I’m most excited to try the coconut chips because I love to snack and always looking for a healthy choice. I am most excited to try the coconut chips as they sound like a yummy snack. I really want to try the Organic Coconut Sugar the most because I want to substitute regular white sugar in my baking. I’m excited to try coconut oil because I’ve never used it before, but I’ve heard a lot about it. I’d love to try Grace Coconut Chips because I’ve never tried them before and coconut is awesome! I am excited to try the coconut chips because I love coconut chips and I would like to compare them to the ones I always get now. The Coconut Chips sound interesting and we would love to try them! I’m most excited to try Grace Foods Coconut Chips because they sound delicious and they would be great as either a snack or for making baked goods. I’m excited about the organic coconut sugar….I wonder if it tastes ‘coconutty’. I would love to try the organic coconut milk to try in all of my curry recipes. I would love to try the coconut chips. I’ve used the Pure Creamed Coconut, so I’m excited to try the Coconut Chips. I’d like to try the Coconut Chips :) Thank you! I am definitely most excited to try the Grace Coconut Chips. Thanks for the chance! I am excited to try the Coconut Chips. Looks very interesting so would like to try them. I am most excited to try the Grace Coconut Chips and the Organic Coconut Sugar!! The Coconut chips stand out for me! I’m interested in trying the Coconut Oil as I have great things about it and that it has more uses than just cooking. I have tried all of these coconut products except for the coconut sugar so I definitely would like to taste it first! I can’t wait to try the coconut chips, they would be a perfect salad topper. I love something crunchy in my salad! Would like to try the coconut oil in my cooking. The Coconut Chips would be the easiest one for me to use as I do a lot of baking and could just throw these in a bunch of recipes. I use coconut sugar in my baking and love to snack on the coconut chips , walnuts & cranberries . I am excited to try the Pure Creamed Coconut as I have not used this before. The Grace Foods Product that I am most excited to try is the Grace Organic Coconut Oil. I would like to try the Coconut Chips. I love coconut and would love to try this product. I’m excited for the Coconut Milk because I am very particular about the consistency of the coco milk I used in my cooking! ooohhh my. That is a hard decision. I think the Organic Coconut Sugar and Organic Coconut Milk would add an amazing flavour to my morning coffee while the Coconut Chips would be a great snack for my kids and the Pure Creamed Coconut just sounds delicious. for me i’m most excited for the coconut chips. I’d love to try the Grace Organic Coconut Oil as I haven’t yet tried it. We’ve tried other Grace products, never disappointed! I would love to try the coconut sugar as i hate the thought of refined white sugar!! I am most excited to try the coconut chips! Oh…because I have never tried them and they sound interesting! I’m excited to try the Organic Coconut Sugar to see how it’s different from just sugar. The coconut chips as they are new to me. I am most excited to try Grace’s coconut chips – I love snacking and these would be delicious! I would like to try the Coconut Oil. It is always on my to try list. I want to try the coconut chips. They sound yummy. Also the coconut oil as it has many uses. I’m interested in trying the Grace Organic Coconut Oil to use in baking as it adds such a nice subtle coconut flavour to muffins and cookies. I’m most interested in trying the Organic Coconut Milk because I’m interested in what it’s going to taste like. I’d love to try the Organic Coconut Sugar! I’m really excited to try the Grace Organic Coconut Oil since I’m trying to incorporate healthier fats into our meals. I am excited to try the coconut chips because I love everything coconut! I would love to try the coconut chips, definitely something new I would like to try. I’d like to try the Organic Coconut Sugar. I think it would give my baking a flavorful boost. I’ve heard so much about Coconut Oil. I’d love to try it. Would love to try the Coconut Sugar. I am most excited to try the Coconut chips because they sound delish! I would love to try the Coconut Sugar. I’m excited to try the Grace Organic Coconut Oil. I use Coconut oil a lot and haven’t tried Grace brand. I would love to try the coconut oil in our baking!! I want to try cooking with the coconut oil! I am excited to try the coconut oil, I have heard great things about it. I would love to try cooking with the coconut oil for the health benefits! I am most excited to try the Organic Coconut Milk because I just made Curry soup for the first time a week ago and it was amazing!!!! I am definitely intrigued by the coconut chips and would love to try those. the coconut oil have heard great things about it.